Oysters help break wave energy produced by boats on the water and also filter the water by taking out pollutants. INWOOD — Dozens of Sherman Creek supporters joined conservationists and local politicians Thursday to celebrate the launch of a habitat-restoration project along the Harlem River shoreline. The pilot project — which will restore the marsh in Sherman Creek Park along 10th Avenue and provide public waterfront space for the community — consists of creating concrete structures known as "oyster castles," said Deborah Marton, executive director of the New York Restoration Project . 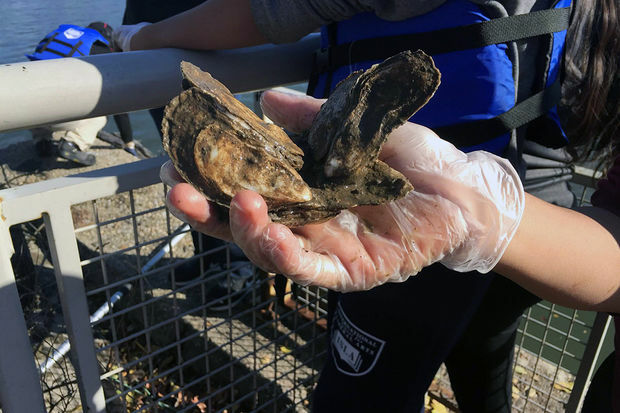 The oysters not only help break wave energy produced by boats on the water, but also filter the water by taking pollutants out of it, she said. State Sen. Marisol Alcantara secured $100,000 from the state Department of Environmental Conservation for the project. “Without the senator’s funding, we wouldn’t have resources right now to do that funding,” Marton said, adding the group is looking for additional financing to do a much larger pilot project farther up the park. “This funding allows us to test strategies, so in a sense it’s phase one of a much larger restoration that will help us to leverage other funding." Salt marshes are important because they act like sponges and protect shorelines against events like Hurricane Sandy, functioning as a “wave-breaking entity during certain storms,” Marton said. Marton said the goal is to implement the strategy along the rest of the shoreline and restore marshes along Inwood Hill Park and Muscota Marsh. Local residents hope this project encourages kids to use the space to learn about the environment. Sherman Creek has been a work in progress, being built up “little by little” since 1997, when the NYRP came to the area. She described the NYRP — which was founded by singer Bette Middler — as “basically land managers,” with the group aiming to make sure low-income communities in New York City have access to high-quality open spaces. The NYRP currently works with the Children’s Aid Society, Friends of Sherman Creek, P.S. 5, P.S. 152, NYCHA and Friends of Inwood Hill Park.